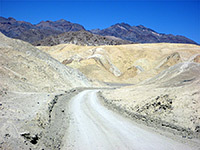 The spectacularly colorful landscape seen most famously at Zabriskie Point extends several miles to the southeast, bordering CA 190, and may be viewed close up via Twenty Mule Team Canyon Road, an unpaved, one-way, lightly-used track that leads up a dry wash then winds through undulating hills back to the highway. 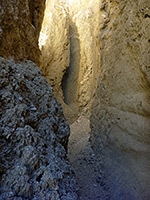 For part of the 2.7 mile distance the eroded badlands at either side have greatly contrasting colors - black or dark brown to the west, cream, yellow and white to the east, and although in the heat of summer this bright, variegated land is best toured only by vehicle, at cooler times when conditions are more favorable for cross-country hiking, the surroundings can be explored; nearby are narrow, twisting ravines, old mine tunnels, patches of mineralized rocks, and above all, amazing views over the badlands, across to the salt flats in the center of Death Valley. 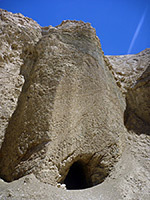 The mines in this region, along the northern foothills of the Black Mountains, were established in the early 1900s by prospectors looking for borax and gypsum, both quite plentiful in the exposed layers of the Furnace Creek Formation. 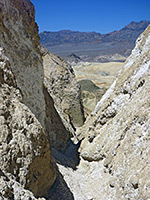 Excavated ore from other Death Valley borax mines was transported by hardworking teams of 20 horses and mules, after which the canyon is named, though it is thought the teams were not employed in this particular area. 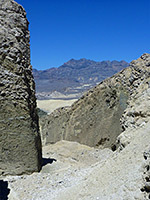 From the signed junction along CA 190 (6 miles from Furnace Creek), the graded Twenty Mule Canyon Road heads along a fairly wide wash for 1.7 miles before turning away to the east, curving up and down a few steep mudstone hills and then rejoining the highway. 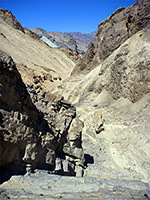 The road is suitable for all vehicles except large RVs or similar, apart from the rare times when rain falls, after which the clayish surface quickly becomes impassable. For the whole distance the surroundings are totally lacking any vegetation, due to the aridity and alkalinity of the soil. An NPS 'No Vehicles' sign at the end of the wash section marks the place where cars were once allowed to drive a little further upstream, and this is the usual start point for hikes into the badlands. The wash soon splits, with the left branch staying relatively wide for a while longer, cutting through more hills of greatly contrasting colors, passing several tunnel entrances then gaining height more steeply, up to a short slot-like section beneath an impassable dryfall. The right branch - the main wash channel - is wider, fairly level at first then climbing via several chokestones or short, sloping dryfalls, all easily passable, and continuing for at least half a mile. 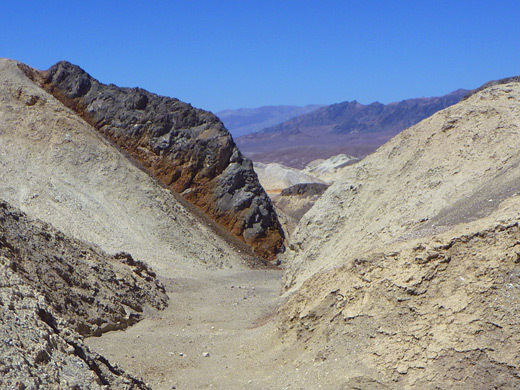 Another hiking option is simply to climb up into the hills, following ridgelines between the branched washes, for wide ranging views of the enclosing mountains.